This is the loss of water from the body, and with it important blood salts like potassium and sodium which play a vital role in the function of organs such as the kidneys, brain and heart. It can lead to confusion, lethargy and problems with breathing and heart rate. Under normal circumstances the sweat we produce when we get hot keeps us cool when it evaporates from the surface of our skin. However, on extremely hot days, or when we over-exert ourselves, this system can fail, and body temperature can start to climb to dangerous levels. This leads to heat stroke or exhaustion. This can cause headaches, dizziness and muscle cramps, but it can also be life-threatening. Heat stroke is particularly dangerous because symptoms can come on very rapidly, and - unless you are watching for the signs - with very little warning. A sun tan may look nice, but it's actually a sign of damage to the skin. Not only is sunburn painful, it can accelerate the ageing process, and increase the risk of skin cancer, including the potentially fatal form, melanoma. 20 ° C (68F) Comfortable. Heart rate normal. 25 ° C (77F) Light sweating. 30 ° C (86F) Discomfort: Blood cools at skin surface. Concentration affected. Moderate sweating. 38-41 ° C (104F) Heat exhaustion: Heavy sweating. Rapid heart rate. Tiredness. Nausea. 45 ° C (113F) Heat stroke: Sweating stops. Hot, dry skin. Core temperature rises. Fainting. Danger of organ damage and death. Drink lots of liquids: As you will be losing more fluid than normal, it's important to top up your supplies. The best way to keep yourself hydrated is to drink water, and to sip it, rather than gulp it down. On an average day, a person weighing 58kg (128lb) should drink eight average-sized glasses of water. As a general rule, for every 2lbs (0.9kg) of body weight, you need one fluid ounce (28.4ml) of water. In very hot weather, consumption should be increased. However, drinking excessive amounts can bring problems of its own. You might think a cold beer is exactly what the doctor ordered, but in fact, alcohol dehydrates the body, and consumption should be kept to a minimum. If you can't face drinking lots of water, non-carbonated soft drinks, such as fruit juice, are a reasonable alternative. Modify your diet: Avoid hot, heavy food. Eat cold foods, particularly salads and fruit with a high water content. Salt pills are available to replace minerals lost in the sweat. However, most diets contain more than enough salt, and so this is unlikely to be necessary. Stay out of the sun: The best place to be on a blistering day is in the shade. If you must sunbathe, then ensure that it's for short periods, and that you use sunscreen with a protection factor of at least 15. If you start to feel queasy or ill then get out of direct sunlight as quickly as possible. The sun is at its most dangerous between 11am and 3pm. Be sensible about exercise: Do not exercise vigorously during the hottest times of the day. Instead, run, jog or exercise closer to sunrise or sunset. Take things slowly and adapt to the pace of life in the sun. If you feel breathless or your heart is pounding, stop what you are doing and try to cool your body down, for example, by taking a cool shower. Rest if you feel faint or dizzy. Keep cool: Wear light, loose-fitting clothing, such as cotton, so sweat can evaporate. Dark, heavy clothes absorb heat, but remember that some thin materials do not provide a sufficient barrier to the sun's dangerous UV rays. 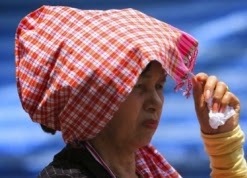 It's also a good idea to wear a wide-brimmed sunhat, preferably with vents. Take a cool shower, bath or body wash: Sprinkle water over the skin or clothing, or keep a damp cloth on the back of your neck. Ventilate your home: if the external temperature is close to or less than internal temperatures, all windows, and internal doors should be fully opened. This helps the natural ventilation to remove heat and increases internal air movement. Windows and internal doors should be left open overnight in a secure manner. Use a fan or air conditioning if you have it. But turn off nonessential lights and electrical equipment as they generate heat. Avoid heat traps: Try to avoid anywhere where shelter is minimal, and ventilation poor. Parked cars can be a particular hazard. If you can, try to stay in an air-conditioned environment. If you have no alternative, but to travel in a hot, stuffy environment - for instance on trains - then make sure you carry a bottle of water with you. If you face a long journey, it may be wise to plan breaks to go above ground for some fresh air. Take special care of the vulnerable: Those most at risk from the sun include children under four, people over 65 whose bodies adapt more slowly to the change in temperature, overweight people whose bodies tend to retain heat more and people who are ill. Babies are particularly vulnerable to heat as their sweat glands are not well-developed. It's important not to wrap them up in blankets or heavy clothing when it's hot - but it's equally important to ensure that they are not exposed to direct sunlight.